Action! Adventure! Thymoic acid suspension! Episodes from Phase fourteen, Temerity Justice and the Diabolist, will appear here when they have been published. The bridge between phases thirteen and fourteen can be downloaded below. Episodes from Phase thirteen, Temerity Justice returns home, will appear here after they have been published. Episodes from Phase Twelve, Temerity Justice: Darkness arises, will appear here after they are published. Episodes from Phase Eleven, Temerity Justice and the Flying City, will appear here after they are published. Episodes from Phase Ten, Temerity Justice and Blood and Fire, will appear here after they are published. Episodes from Phase Nine, Temerity Justice and the Reavers, will appear here after they are published. Episode twelve - Where is everybody? Episode thirteen - Alice, what's the matter? As they come to be replaced, previous episodes of Temerity Justice will appear here. If you want the whole story as a single ebook, they will be available on Kindle when completed here. Episodes from Phase Eight, Temerity Justice and the NDZ will appear here after they are published. For information, NDZ is Neutral Demilitarised Zone. After defeating The Despot, Temerity Justice is back at Camber Gal Wen. Things are about to be shook up by the military, but what does it mean for the future? Episodes from Phase Seven, Temerity Justice and The Despot, will appear below as they are archived. Phase Six sees the Dandy Crew heading off to take on The Despot for one last time. The episode below takes place between Phase Six, Temerity Justice and Doctor Perdite, and Phase Seven, Temerity Justice and The Despot. Episodes from Temerity Justice Phase Six, where she investigates the mad Doctor Perdite, will appear here as they are archived. This episode bridges the gap between the end of Phase Five and the start of Phase Six, Temerity Justice and Doctor Perdite. Episodes from phase five, Temerity Justice and Twisted Justice, will appear here as they are published. These episodes takes place between phases four and five, though they don't form a phase themselves. Each is a short story of about four or five episodes, though they are inter-related. Episodes from Phase Four, Temerity Justice and the Hunt for Devistere, will be uploaded here when they are published. The phase below bridges the gap between the end of phase three, Temerity Justice and the Roving Inquest, and the start of phase four, Temerity Justice and the Hunt for Devistere. This is now the amended version, uploaded on 23 October 2015. Phase 3 and 4 bridge episode - Camber Gal Wen. Episodes of Phase Three, Temerity Justice and the Roving Inquest, will appear here as they are uploaded. Back issues of Temerity Justice loves Kyle will be uploaded here as and when new issues are published (so, each Friday, then). 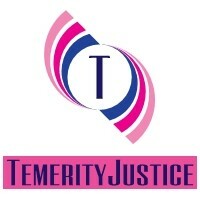 The complete Temerity Justice and the Hangman can be found here for the time being. At some point I will be removing this, and the story will only be available through Amazon Kindle. Bonus stories will appear here after they have been on the homepage for a while. Bear in mind that these don't always fit in with the overall timeline of the main stories, but are additional material I have developed while working on the over-arching narrative. The Heston Werewolf - This is set with Temerity's sidekick from phase two, Kyle Kenton, though it is outside the narrative framework. Across the Plains - This sees Temerity Justice escorting rebel fundraiser Annabelle Lee across Farsland, and a discussion between the two as they go. Hostile Hostel - Temerity investigates strange disappearances up in the hinterland of Farsland. Based losely on a real life crime of the 19th century. Temerity Justice and the Machine alternative version - This is an alternative version to the current episode, which I wrote alongside it. I had two ideas of how Temerity would resolve the problem of the Machine, and wrote both out. In the end, my proofreader preferred the other version, but I kept this one on file as I still kind of like it. 13a Out of the Joint - As with previous episodes, I wasn't entirely happy with the first draft of Phase Two Episode 13 and ended up writing two versions. The map to the left is a Work in Progress of the area where Temerity has adventured so far. There are places on the map that she has not been to, and is unlikely to get to, but they were part of my original plan so I have included them. You'll also note that the land represents a corner of a much larger continent, though I haven't finalised the whole area. 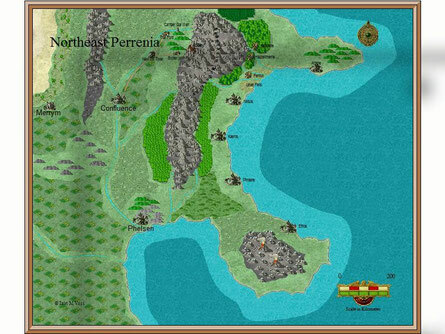 This is my first serious attempt with Campaign Cartographer 3+, so please forgive how simple it looks. I'll be playing around with the program more in the future, so I will probably update this. On the plus side, I think this shows how easy Campaign Cartographer 3+ is to learn, with just a play around with the tutorial and a view of about six videos. If you click on the image, it will open as a PDF, and can then be viewed with a bit more ease. And as I expected, I have noticed that there are some things I have got wrong on the map. I will hopefully get to work on it this weekend, and will upload a replacement when it is ready.